G.P. Putnam's Sons, 9780451234391, 256pp. An award-winning story collection from the author of The Confusion of Languages. Through fiction of dazzling skill and astonishing emotional force, Siobhan Fallon welcomes readers into the American army base at Fort Hood, Texas, where U.S. soldiers prepare to fight, and where their families are left to cope after the men are gone. They’ll meet a wife who discovers unsettling secrets when she hacks into her husband’s email, and a teenager who disappears as her mother fights cancer. There is the foreign born wife who has tongues wagging over her late hours, and the military intelligence officer who plans a covert mission against his own home. Powerful, singular, and unforgettable, these stories will resonate deeply with readers and mark the debut of a talent of tremendous note. Siobhan Fallon is the author of the novel The Confusion of Languages and the short story collection You Know When the Men Are Gone, which won the PEN Center USA Literary Award in Fiction, the Indies Choice Honor Award, and the Texas Institute of Letters Award for First Fiction. Her writing has appeared in The Washington Post Magazine, Woman’s Day, Good Housekeeping, Military Spouse, The Huffington Post, and NPR’s Morning Edition, among others. She and her family moved to Jordan in 2011, and they currently live in Abu Dhabi, United Arab Emirates. In the first story, "You Know When the Men Are Gone," why does the narrator develop such an obsession with her neighbor? While it turns out that Natalya is worthy of Meg's scrutiny, is it easier for Meg to be a nosy neighbor than for her to focus on the danger her husband faced overseas? Infidelity is a recurring theme in many of the stories. Did this surprise you? Most of the stories take place in Fort Hood. Why do you think "Camp Liberty" is included in the collection if it takes place in Iraq? Is it in keeping with the other stories? In "Camp Liberty," "Leave," and "The Last Stand," the main characters are men. Does that change the feel from the rest of the collection, which is primarily from a female point of view? 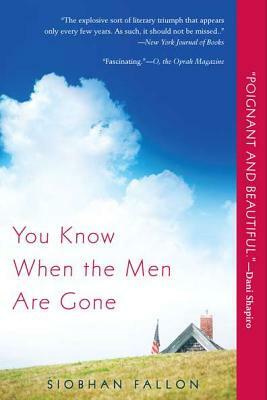 Many of the stories in You Know When the Men Are Gone are about the relationships between men and women. How would these stories change if the protagonists were flipped? If, say, "Inside the Break" was told from Manny's point of view instead of Kailani's? Or if "Leave" followed Trish instead of Nick? In "The Last Stand," why does Helena sleep with Kit in the hotel room? Do you find her sympathetic? In "Remission," Ellen feels that she is pitied by the other wives because of her cancer, but considered lucky because her husband has not been deployed. Does either of these circumstances outweigh the other? Is there a sliding scale of "tragedy" and "luck" in the lives of the families in Fort Hood? In your own life? "Inside the Break" mentions pamphlets with such titles as "Roadmap to Reintegration," "What to Expect When Deployed Soldiers Return," and "Communicating with Your Spouse." Is it possible to sum up, in writing, the vast emotional landscape that families and soldiers experience upon the soldiers' return? Do you think Siobhan Fallon attempted to do that with this collection? If you think so, did she succeed? What do you think the husband does at the end of "Leave"? In "You've Survived the War, Now Survive the Homecoming," the sign refers to drunk driving, but do you think the author intends it as a metaphor for more? In the same story, toward the end, Fallon writes: "Their fate depended on whether Carla walked out of the room with the baby or stood next to her husband. She bit her lip and wondered if this was the sum of a marriage: wordless recriminations or reconciliations, every breath either striving against or toward the other person, each second a decision to exert or abdicate the self." Do you agree with this take on marriage? Or do you think it's applicable only under extreme circumstances? Which is your favorite story, and why? Obviously the stories in You Know When the Men Are Gone are tied together by Fort Hood. What other themes do the stories share?